Click Add Content to open the content tray. Then drag and drop a Text/HTML module onto the page and type or paste your text (i.e., email address) into the module. Use your cursor to highlight the email address you would like to become a link. Then, click the link icon in the WYSIWYG editor to open the Link dialog. In the Link dialog, use the Link Type drop-down menu to select External. Use the Protocol drop-down menu to select mailto: Then, click into the URL field and type/paste the link URL. You'll need click OK, Publish the page, then log out to test your email link. 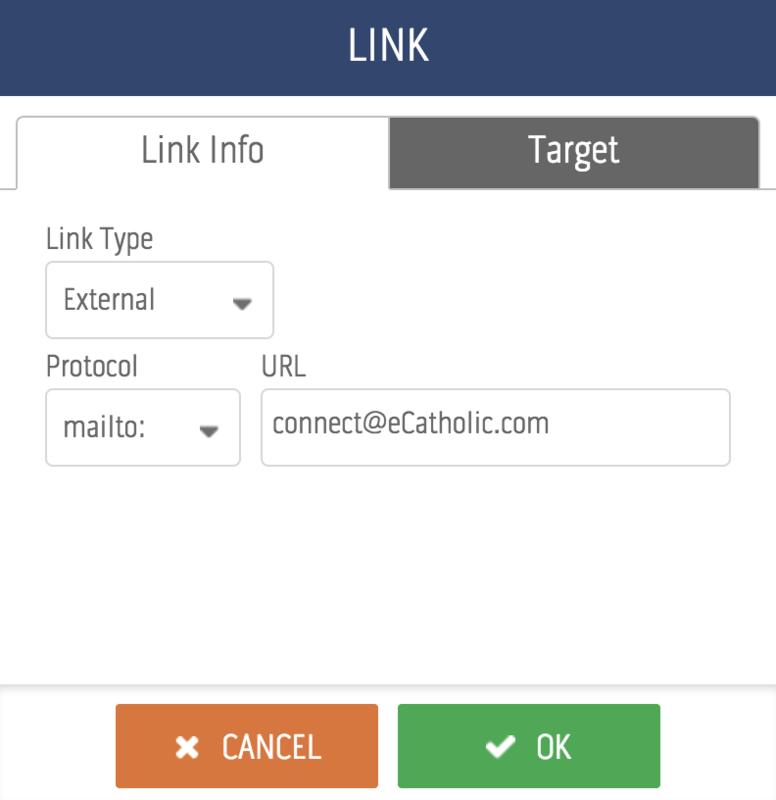 We recommend that you use the eCatholic People module to display email addresses. The People module obfuscates email addresses so that it is harder for bots to read and spam those addresses. An email link will open whatever program the visitor has set up on their computer to process email. (e.g., If their computer is set up to use Outlook as the default email program, the email link with automatically launch Outlook, even if they only use webmail (email through a web browser).